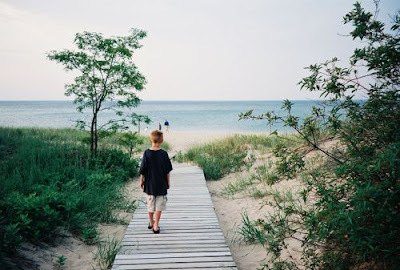 One summer, when the boys were younger, we decided to drive around Lake Michigan. Our first stop was Kenosha, Wisconsin where we enjoyed our first view of the lake. We explored the beach, climbing on large rocks and walking on sand that was soft beneath our feet. We continued down to Gurnee, Illinois for a visit to Six Flags Great America. The boys posed with the cartoon characters, and we had fun going on rides and playing in the Foam Factory. The next day, we stopped near Mears, Michigan where we toured the Silver Lake Sand Dunes with Mac Woods Dune Rides. Our guide shared some of the history of the dunes, including the fact that most of the pine forests in the area were cut down for wood to help rebuild Chicago after the Great Fire of 1871. The few trees that remained were destroyed by lightning fires, so erosion is a big problem. We had lunch and played at the beach in Manistee. Again, the sand was softer than we were used to. In Minnesota, the sand is rougher, and grittier, so we kept noticing the difference. After lunch, we drove up to Empire where we visited the Dune Climb at Sleeping Bear Sand Dunes National Lakeshore. 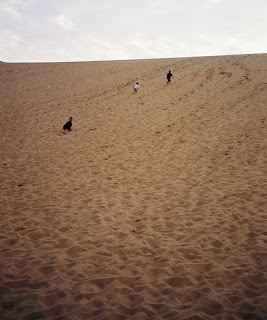 The boys had a great time climbing the dunes and running or falling all the way down. We camped at D.H. Day campground and spent the evening exploring the rocky beach and skipping rocks.